The beautifully bred Ballymacoll Stud homebred ABINGDON made a spectacular seasonal debut in the Listed Castle Fillies Stakes at Pontefract on 25th June when beating her rivals by an effortless ten lengths. 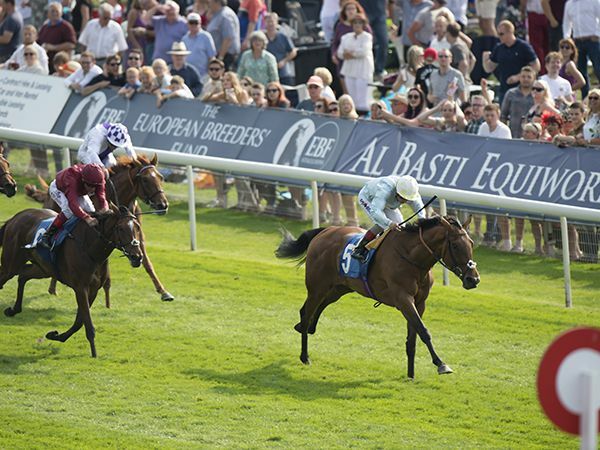 Trained by Sir Michael Stoute, the four year old daughter of STREET CRY brought her tally of Listed race wins to three, adding to victories in the Galtres Stakes at York and the Lord Weinstock Memorial Stakes at Newbury in 2016. Currently rated 110, ABINGDON is out GALILEO mare JUSTLOOKDONTOUCH, a daughter of Blue Hen mare HELLENIC whose progeny include multiple Group 1 winning Champion Three Year Old filly ISLINGTON as well as Group 1 winners GREEK DANCE and MOUNTAIN HIGH. ABINGDON is to be offered at Tattersalls as part of the Ballymacoll Dispersal at the Tattersalls December Mares Sale which takes place 4th-7th December 2017.